I need help trying to correct a problem with a Canon IP5200 streaking on colours. 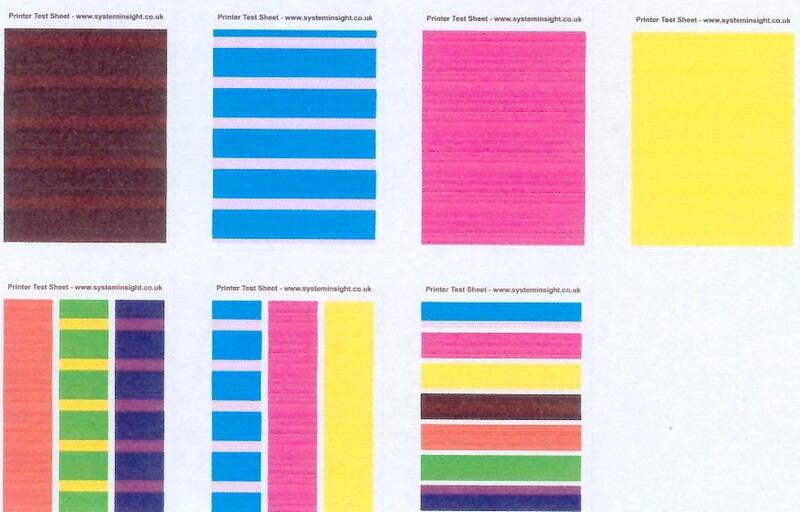 Printing any coloured image results in streaks/horizontal lines, regardless of print paper used. Solid colour tests have the same results as photos and text. I have run multiple deep head cleaning and print head alignments and test pages. I have also cleaned the head assembly using distilled water in an overnight soak. I continue to get streaks. There is no sign of leakage inside the printer compartment. I have changed the ink reservoirs and replaced them with brand new ones. I have tried printing using a different computer and a different operating system, same problem persists. I have even re-installed the latest available printer driver and set all settings back to their defaults. No luck in removing the streaks. Print tests used taken from http://www.systeminsight.co.uk/Canon_Printheads_TestPrints.htm. See a scan of the results as a .jpg attachment. if horizontal lines get "doublestriked" or are missing it must not allways be a problem of the printhead. "wearout" of transmissionparts of the papertransport. In the former printers ( those built before 1990 )most of the parts have been manufactured by using steelparts. At the end of the 80´s and beginning of the 90´sthe manufacturers started to make important parts by component plastic aiming for so called: "planed obsolescence" and saving money - targeting the printers to "wear out"
within maximum of 5 years of "avarage usage". But the "wearout" of the plastic parts is a disadvantage you can´t handle by software. Specifically companies like Canon, Lexmark, Brother and Epson are known for this kind of "planed obsolesence". Even cheap models from HP are known for rather fast "wearout". Better transportsystems are only used in printermodels desinged for "heavy office use" and are much more expensive. Thanks for the info speedyG. I have barely used my Canon printer as it is for home use only. I probably have only used it once a week throughout its lifetime and it doesn't even have a scratch on it, such a shame. I can still use it for printing monochrome images and letters, so it's useable for a while yet. I just can't print colour photos or diagrams. limit that depends to manufacturer and model. and from 100 Gramm to 240 Gramm at Photopaper. to "swallow" the ink transferred to the surface and not preventing it from intrusion of the paper. which kind of paper and weight of the sheets your printer can handle best. original ink and refilled cartridges. In refill cartridges in general inksorts are used with more fluid than original ink and higher viscosity. than with original ink ( which you would claim to be "crisp sharp" or "less crisp" ). manufacturer of that kind of paper your printer can handle with best performance. I found a setting (under WindowsXP) in printer Properties, Advanced tab relating to Spooling. When I turned off spooling and used the "Print directly to printer" option, the colours printed almost exactly as they should do. I used 80 Gramm white paper. Under Canon IP5200 Printing Preferences I also set the options "Vivid Photo" and "Image Optimizer" and used a High print quality level. I expect this will drain my ink tanks quicker but I can live with that. For now, at least, the printer is useable for a while longer, although I haven't tried printing on thick photo-quality paper.